is rated 4.6 out of 5 by 49. 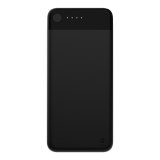 BOOST↑CHARGE™ Power Bank 10K with Lightning Connector is rated 4.6 out of 5 by 49. 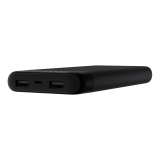 Rated 5 out of 5 by Alreadybeenthere from BoostCharge Power Bank 10K Experience Review of Belkin BoostCharger Power Bank 10K Received this on Oct. 6th, 2018, unpackaged the next day. The packaging is extremely well done. The package is formed to hold the contents very well, so they do not move around during transport. Included in the package is a set of warnings/specs written in many languages. 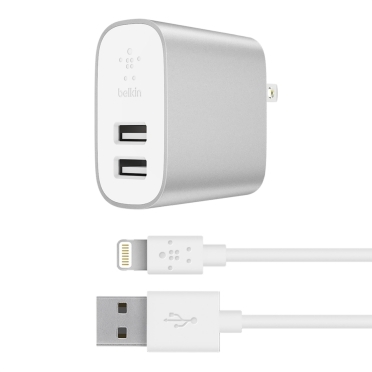 Also the BoostCharger does not come with any cables for charging the unit or your electronics. Something the I think should be included in the package. The only thing I think that was missing was an explanation of the unit itself (i.e. operation instructions). The BoostCharger is available in both Black and White, mine is a white model. On the front is one bottom and four led lights. I have to assume that each light represents 25% of the capacity of the 10K (10,000mah) BoostCharger. First thing I did was charge the unit up. It arrived with about a 25% charge, so the BoostCharger took about 5hrs, 50min to charge to 100%. Not bad for a 10K capacity unit. I have used the Boostcharger for about a week now, charged things like; headphones, sports watch and iPhones. Charged one iPhone 6 that was completely dead (would not turn on) from 0% to 100% in about 2 1/2 hours. I thought this was as good as an Apple charger if not better. So far I have been impressed by the BoostCharger. It is a little bit large for sticking in your pocket for carrying around, but I carry mine in a small bag or my computer brief case. Works out pretty good for me. I know a week is really not enough time to fully test this unit for durability, but I will proved an update in another week or so. Be sure to check out the photos. 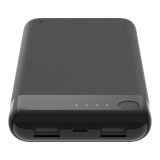 Rated 4 out of 5 by Mike2me from Great product poor packaging and poor instructions The Power Bank came quickly but the instructions it came with were too small to read and lacked a QR code to get me instructions. I wanted to charge it correctly to get the best use of the Power Bank. i did finally charge it and used it on vacation. It worked very well on the plane so I could watch hours of TV on my iPad Pro and also power up my iPhone that was drained from mapping me to the airport. It’s small and light so it’s no problem to pack. I also use it in my back pack to top off my phone as I commute. All in all the product performed well once I got past the lack of instructions or easy access to instructions. Rated 5 out of 5 by evasquez from Super speed charging! 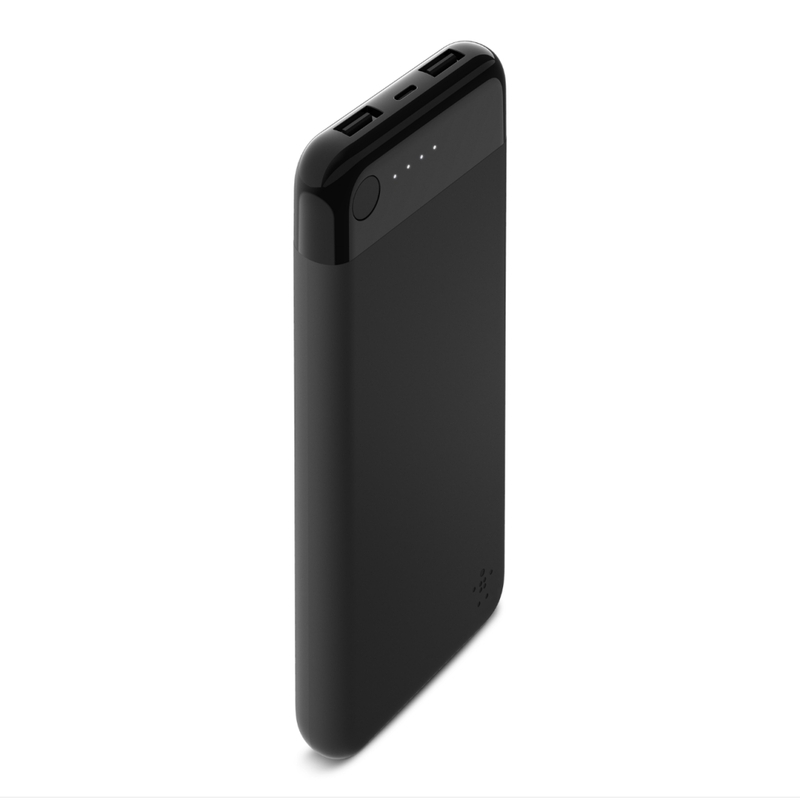 This Power Bank is Amazing, It recharges my iPhone in the blink of an eye! Rated 5 out of 5 by LosAngeles1 from You only need one cable when used with iPhone/iPad This portable charger is a bit bulky, but that comes with the territory if with you want one with 10,000 mAh of battery capacity. There are many portable phone chargers out there, but the distinguishing characteristic of this one is that comes with a Lightning Port. That means that when you are using this charger to charge your phone with a USB-to-Lightning Port cable, you can simply reverse that same cable and use it to then charge this portable charger. This cuts down on one extra cable that you will now no longer have to carry with you. For me, this is a very worthwhile feature and one that makes this charger stand out from the rest. One note: the charger only came partially charged, so plan on charging it completely before you first use it. Mine took several hours before it was completely charged. Also, this portable charger does not come with any cables, so you will have to supply your own. Rated 5 out of 5 by scasturo from Thoughtful design! I have purchased around ten power banks from various manufacturers over the years and I can definitely say this one is my new favorite for one simple reason: no more separate charge cord. Every power bank I have purchased uses a micro USB for charging the power bank itself and then of course I needed a separate lightning cable for charging my iPhone/iPad. I can't tell you the number of times one of our family members has lost the charge cord for the power bank. Belkin once again shows their prowess for providing a simple solution to a needless problem. The power bank itself charges very fast. My iPad always takes a very long time to charge on other power banks, but with the addition of a 2.5A USB port, this charger got the job done very quickly! Overall, the device feels solid with no loose material on the outside to worry about snagging or breaking, so tossing this in my center console or gym bag is a non-issue. 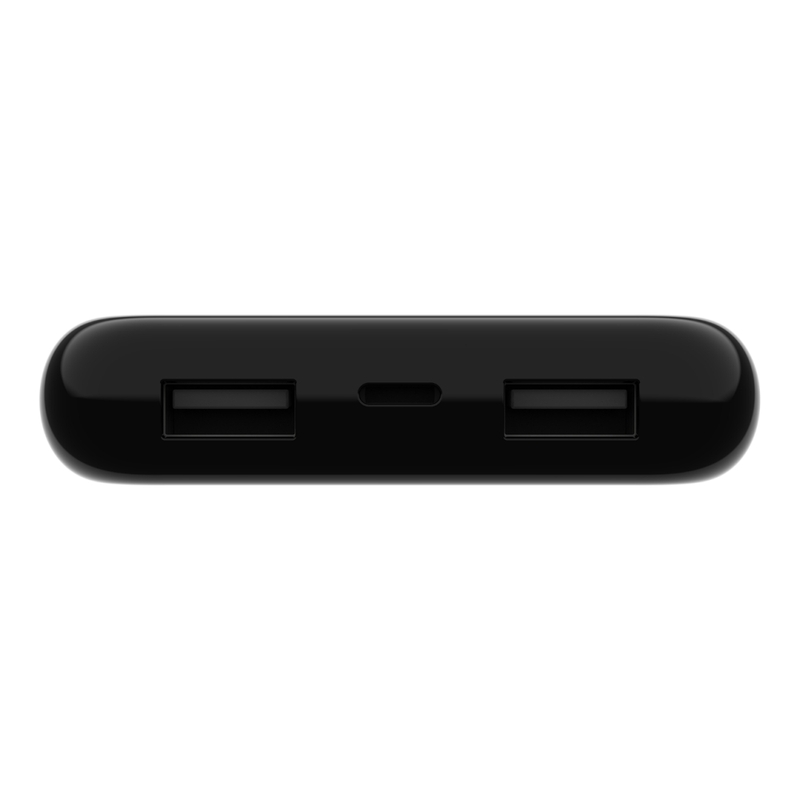 Over the years, I have slowly upgraded many of my devices to Belkin products as I have found they are almost always of high-quality and usually have thoughtful features that many competitors miss in their design. The design of this product is another example of that attention to detail. 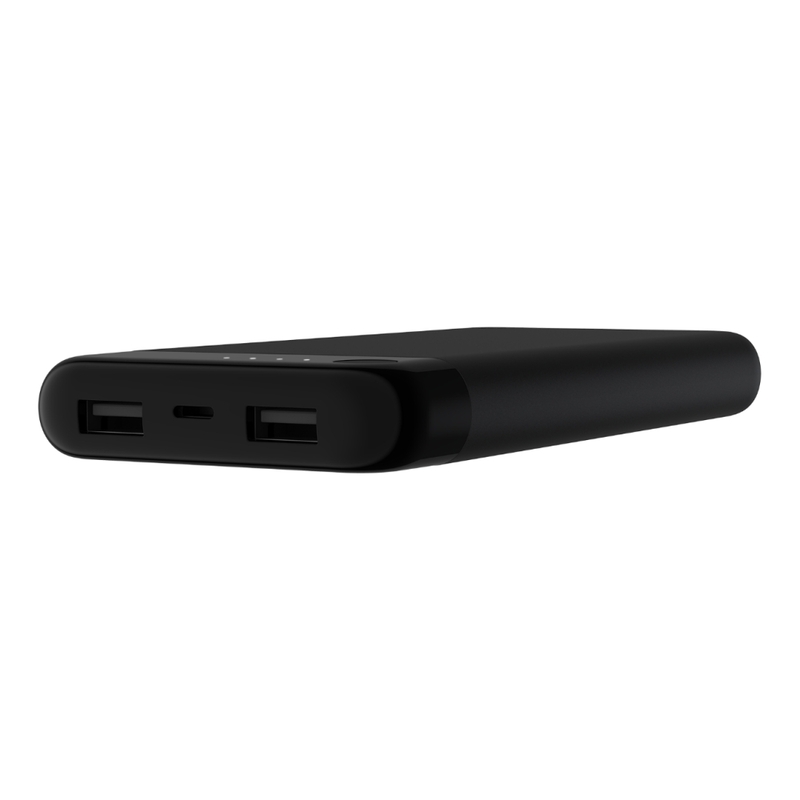 I feel that Belkin has provided Apple users with an excellent solution to on-the-go power needs with this power bank. One thing to be aware of is that the product does not come packaged with a lightning cable. I have countless of these lying around, so this was a non-issue, but something to be aware of. Honestly, I think this was a smart decision because I'd rather pay less and use one of my many extras than pay more for yet another cable. Lightning cable included or not, this is my new favorite charger...now I just have to get the rest of the family to stop claiming it for themselves! Thanks for another great product, Belkin! Rated 5 out of 5 by AlyStolbz from Super convenient I was able to use this charger to charge up my iPad pro when I couldn't use a wall charger. I like how you only need to use the lightning charger to charge the device and then to charge up the charger! Less cords = great! Rated 5 out of 5 by jvlJosh from Great mobile tool! This tool is great when you're working in the field and need an extra charge when power is not readily available.